I have learned a lot about being a librarian while going to school for my masters. Really. All kinds of technical stuff like classification, collection development, that special code librarians have called MARC, and all about who in the world was Melville Dewey. But some of the most useful information I’ve picked up has been about people skills; how to be approachable & personable. Maybe you’re surprised that I have learned some of this from a textbook & maybe you’re wondering if some of the librarians you’ve known took (& passed) this class, but I promise you, it is there. 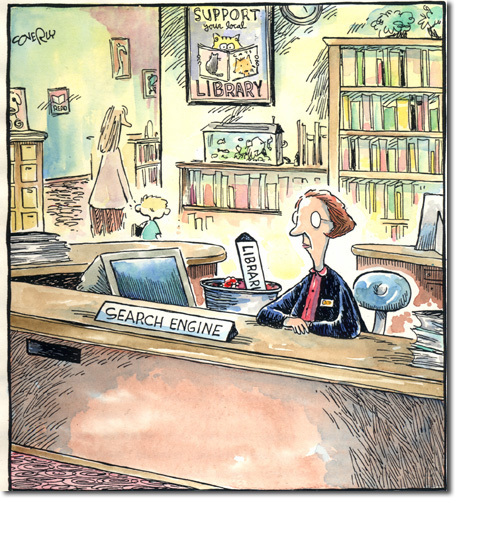 In my textbook Reference & Information Services in the 21st Century is a list of “Behaviors to Avoid” for all librarians, but, specifically for those who have been asked for help with finding some answers. I have reworded these a bit and I hope to have them someday taped up in my future office; just like the rules I can see from my car (yes, fast food managers, we can see those) when I’m ordering my milk shakes, etc. You know, those rules from managers about smiling & asking if they want fries with that. 1) Do not provide an unmonitored referral. In other words, don’t just give the user a call number, wave your hand in the general area & send them off. Make sure they know exactly where to look. 2) Do not suggest that the user should have done some independent work before asking for help. 3) Do not try to get the user to accept information just because it is more easily available than what they really need. 4) Do not suggest, or even imply, that the information they are looking for cannot be found because it is just too hard, too obscure, or elusive. Do not say that not only can this information not be found at your library, but that it cannot be found at any library in the whole world. 6) Do not leave the desk, never to return. I’m glad I have these rules to refer to because I have a feeling there will be days when I will be tempted to break all of these rules; especially #6.